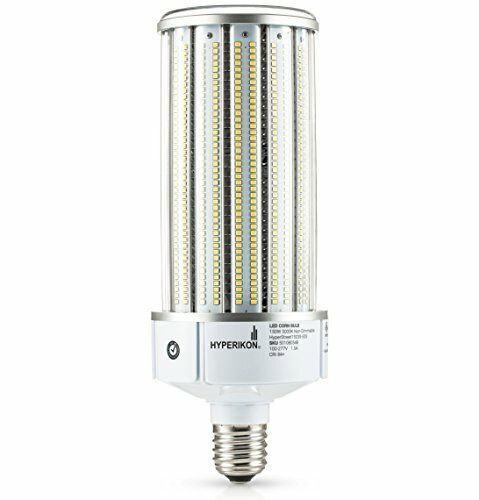 Enhance your outdoor or indoor environment with the brand new Hyperikon high lumen street lamp. Hyperikon has strived to engineer an energy-efficient yet simple and beautiful light - the result is the street light series providing a wide range of both wattages and colors. The 150w street light bulb has a large screw base (E39). The lights can replace high-intensity discharge (HDS) and low pressure sodium (LPS) luminaires. With 45,000+ rated hours of lifetime, the bulb will last over 20 years with 6 hours of usage per day. Commercial and industrial grade - constructed with heavy-duty corrosion resistance die-cast. ✔ SUPER BRIGHT - With an incredible light output of 19,500 lumens or 130Lm/W and 360 directional light, the 5000k corn bulb illuminates large areas both indoor and outdoor with a crystal white glow. ✔ HIGH PERFORMANCE - Constructed with 1070 cold forged aluminum and thermal conductivity 236W/mK, enhances the 150W LED corn bulb in heat dissipation. ✔ ENERGY EFFICIENT - Reduce your electricity running cost with up to 80% by replacing 500W-750W HIP/HID bulbs with 150W LED. The energy savings and the LED average lifespan of 45,000h makes for a smarter investment and a more sustainable lighting solution. ✔ INCORPORATED IN U.S - Hyperikon is incorporated in California and based in San Diego with over 50 employees among them veterans. Buy with confidence and peace of mind from a family owned and operated business.